The beginning of April marks the cherry blossom season on Jeju Island, with the rest of Korea following swiftly as temperatures rise. 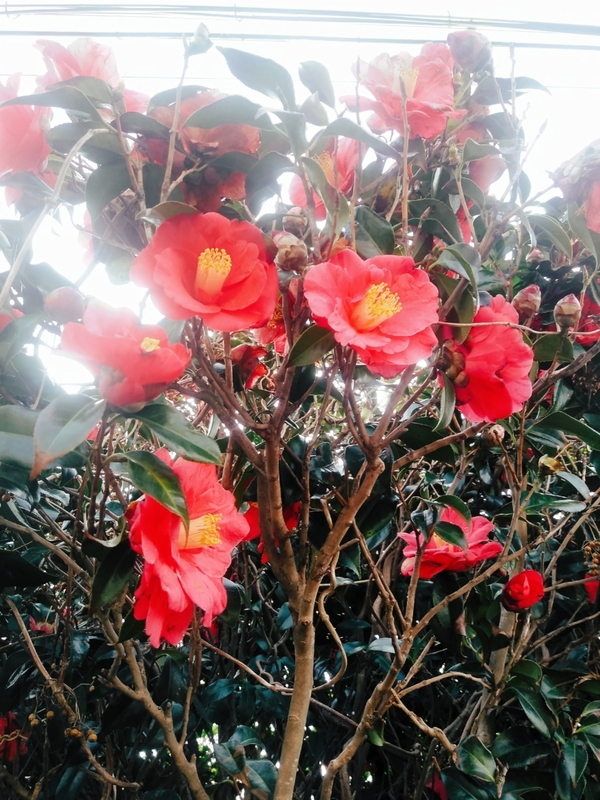 For a few beautiful days, the whole island is covered in flowers - not only cherry blossoms, but yellow canola flowers and the last of winter's camellia flowers can be found. Spring is in the air and everyone heads outdoors for a picnic under cherry trees or to one of the festivals that celebrate the season. If you plan on catching this colorful and romantic moment in time when you travel to South Korea, it's best to keep an eye on weather predictions and plan your trip accordingly. I've got some tips for you below - and a whole lot of pictures and travel sketches to capture that cherry blossom ~aesthetic~. Despite a full schedule and, well, air full of fine dust pollution, I just had to take a short trip to the south-east of Jeju Island when the weather cleared up! As I mentioned, the cherry blossom season is both incredibly beautiful and incredibly easy to miss. A single day of rain and wind can wash away all the petals, and the unpredictable spring weather doesn't make the task of finding the perfect cherry blossom day easy. Literally on the day after I took these pictures, we had a full-on storm and temperatures dropped back to the lower tens. Each year is different, and each region of Korea has different peak cherry blossom times. Last year, we had our cherry blossom season on Jeju during late March, but this year, the cold weather dragged on and everything moved to the first week of April. Cherry blossoms aren't the only sign of spring and especially Jeju Island combines so many different facets of nature. The region around Hallasan (the volcanic mountain that marks the center of the island) is still cooler, with snow on the very top of the mountain and camellia flowers as well as mandarin trees dominating the lower regions. Yellow Canola fields catch the eye - and nose! - and in the various botanical gardens around the island, you can discover more rare blooms all in one place. The stark climate differences from one part of the island to the other is fascinating to me. While the north-east (where I live) sports mostly radishes and carrots, just a half hour drive to the south completely changes the landscape and flora. Suddenly, radish and potato fields make room for citrus fruit orchards and palm trees. If you have the time while you're visiting Jeju Island, I very much recommend striking out on your own, by bus or rental car or even on foot along the Olle Hiking Trails and discover those different parts and atmospheres for yourself. If you're more pressed for time, the botanical gardens and seasonal festivals offer a great way of getting a lot of nature and variety in one go. When the weather decided to play extra nice one day, we took a half-day off for a quick Jeju Island tour! Without much of a plan and just following the road with a sense of optimism, the cherry blossoms and canola flowers were easy to find. I tried to take some pictures that aren't 120% awkward. I've gotten used to the sheer number of pictures necessary on any trip here among Koreans - everyone seems to be always camera ready and with a repertoire of poses at hand for every occasion. Personally, I love to combine those pictures with drawings, sketches, and notes in my journal. It's a lot of fun to keep personal memories this way! Visual diaries - no matter if they're made with drawings, quick doodles, hand-lettering, or a collage of printed pictures (pressed flowers and used tickets are lovely, too!) are a creative and very tangible way of keeping a journal while traveling. You can get inspiration from some of my previous travel journaling posts or check out more in-depth tutorials and tips here! I adore this new class on journaling called "Draw Your Life" so that could be a creative way to get started, too. You can use the whole Skillshare premium library for free as a two-month trial with my referral link. Makeup flatlays - I love drawing these! They're so simple, with just the rough forms of each product and a hint of color. 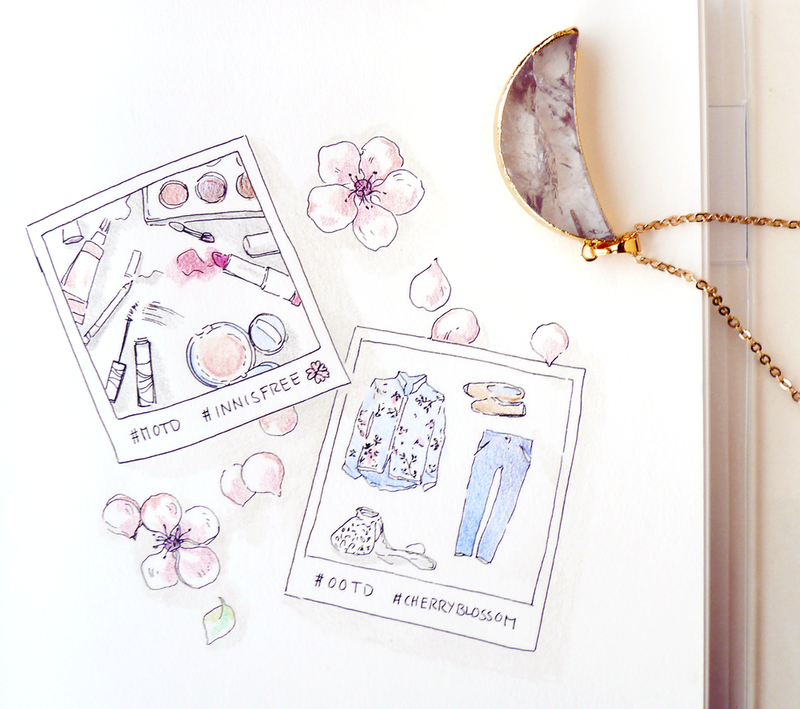 Makeup is a form of art and I like to think of these doodle flatlays as a form of fashion illustration. A cute Polaroid picture frame brings the whole image together. Innisfree Ampoule Moisture Cushion in C13 The air is still quite dry, so I stick to my winter foundation. For short trips like this, a thin layer of cushion foundation works best, since it's quick to apply in the morning and easy to touch up during the day. Volumecara Mascara Innisfree came out with these additional versions of their Microcara Mascara a while ago, and I love both the "Long Long Cara" and "Volume Cara" despite the quite silly names. They're definitely still tiny and delicate, but there is a volume boost without the lashes clumping together (huge pet peeve!). Innisfree Smart Drawing Strobing in #1 Pink Light Powder highlighters don't work very well on my dry skin and can look off when used on top of 'dewy' foundation, especially. I really enjoy this combination of a liquid highlighter and built-in brush. It so speaks to the illustrator in me! The color is subtle and natural, but still brightens and highlights my measly cheekbones. This brow pencil is a lot thinner and more precise than the Auto Brow Pencils from the same brand and I love to combine it with the soft brow powder brush/stamp that makes up the other side of the pencil. My full palette of eyeshadow is still in use despite some of those shadows now p.r.o.b.a.b.l.y being over their expiration date. Oops. But I've never had any adverse effects from using these and hate to be wasteful, so on we go! I just use a beige color as a base, then use a dark brown to blend like an eyeliner. The actual eyeliner I used ... I forgot to draw that one! Usually, I don't like waterproof makeup on my eyes since it's a pain to remove, but the eyeliners by Aritaum have such a gorgeous texture that I'll use them anyway. On my lips, I'm wearing an all-time favorite of mine: The Real Fit Lipstick in #8, Rosy Latte. Despite the name, it isn't all that pink, but has a very muted hue that looks different depending on the light - combining brown, mauve, rose, and burgundy tones. You can find a detailed review and swatches here! I'm such a fan of slacks! That one (cheap...) pair is partially made from linen and works for every climate, from Korean spring to vacation in Thailand! Because it's the perfect season for florals, I went with a more romantic and girly choice for my top: A blouse with a cherry blossom pattern. Loose and lightweight blouses like this are great for the transitional period between spring and summer when there's still a cool breeze in the air. With all the cherry blossom season hype here on Jeju Island, I was overjoyed when a new art commission for a music album cover required MORE flowers. This time in painted form. While I can't show the finished illustration (yet!) 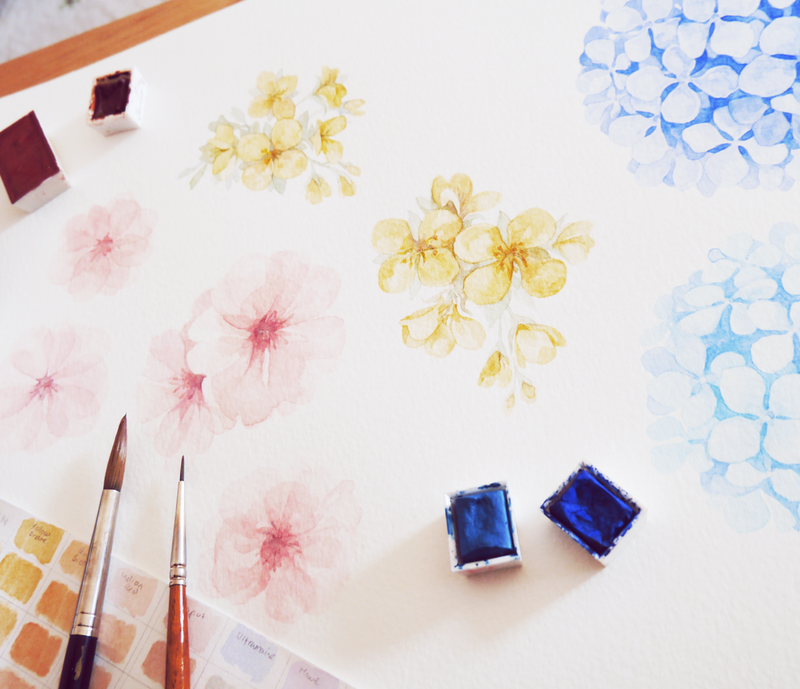 here's a glimpse at the watercolor cherry blossoms, canola flowers, and hydrangeas that make up the pattern. One word of caution: Spring is, sadly, a time of severe air pollution. The winds carry whole dust clouds from the Chinese mainland towards Jeju Island. Those air pollution levels are unpredictable, changing with the direction and strength of the wind. Yellow dust, fine dust, micro dust - there are different kinds of pollution, and they change independently from each other. They can cause allergic reactions, coughing, skin breakouts, and are carcinogenic. The height of fashion. Thank you, fine dust. Get an App that shows current pollution levels in your region. I use MiseMise (misemeonchi means fine dust) which, while being in Korean, has very apt visual representations (aka emoticons) for each level. Avoid going outdoors unprotected during peak times and close your windows! Wear a mask tested for fine dust. A simple textile mask won't cut it, as the dangerous micro dust particles can enter through those. Clean your skin well, especially after a long day outdoors. The fine dust enters pores, so take extra care, give yourself a good scrub - and I use a clay mask on my face to help getting that stuff out! There are special sunscreens, foundations, and facial mists with blocking properties available, too. Stay in the forest. We finished our cherry blossom trip with a walk in the woods instead of in the open fields. The trees offer protection from the wind, catch dust before it enters, and purify the air. I hope you liked this (kinda random) collection of journal drawings, photography, and travel tips! Have fun discovering Jeju Island in spring!